Welcome to Delta Dispatches with hosts, Jacques Hebert & Simone Maloz. 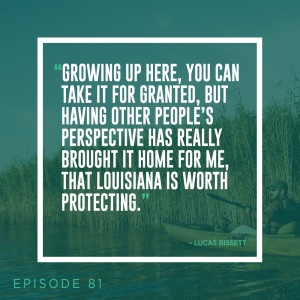 They’re joined by Lucas Bissett, Fly Fishing Charter Captain of Low Tide Charters, who talks about his role with Low Tide, getting a first-hand view of Louisiana’s coastal land loss crisis, and his documentary. Later in the show, they’re joined by Ryan Chauvin, Digital Marketing and Communications Manager for Restore The Mississippi River Delta Coalition and National Audubon Society to talk about a new ad that will air during this weekend’s big game!